Syrian regime is ready to talk with all parties, including armed rebels, said Foreign Minister Walid al-Muallem. The Syrian regime is ready to talk with all parties, including armed rebels, who want dialogue to end the conflict, Foreign Minister Walid al-Muallem said on Monday at talks with his Russian counterpart Sergei Lavrov, according to AFP. "We are ready for dialogue with all who want dialogue, including those who are carrying arms," Muallem said at the Moscow talks with Lavrov, in an apparent reference to the rebels battling the regime of President Bashar al-Assad. "We still believe in a peaceful solution to the Syrian problem," said Muallem, pointing to the creation of a government coalition that would negotiate with both the "external and internal opposition." Lavrov said alongside Muallem that there was no alternative to a political solution to the two-year conflict agreed through talks. "There is no acceptable alternative to a political solution achieved through agreeing positions of the government and the opposition," said Lavrov. "We are for Syria to be independent, united, and for all Syrian citizens, regardless of their religion, to live freely in peace and democracy. 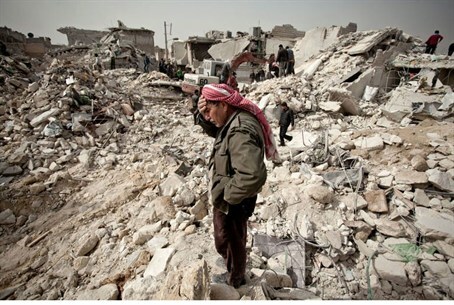 "The Syrian people should decide their fate without external intervention," said Lavrov, as quoted by AFP. Lavrov added that the situation in Syria was "at the crossroads" but expressed optimism that a negotiated solution could be found. "There are those who have embarked on a course of further bloodshed that risks the collapse of the state and society," Lavrov said. "But there are also sensible forces who are increasingly aware of the necessity to begin the talks as soon as possible to reach a political settlement. "The number of supporters of such a realistic line is growing," said Lavrov, according to the news agency. Lavrov had said last week there were positive signs from both sides of a new willingness to talk but called on the regime of Assad to turn oft-stated words about its readiness for dialogue into deeds. The fighting -- which according to the United Nations has claimed 70,000 lives since the conflict began in March 2011 -- has further intensified in the last days as both sides press for the military advantage. Russia has also been working on agreeing a trip to Moscow, possibly in early March, by the head of the Syrian opposition National Coalition, Ahmed Moaz al-Khatib. However, the rebels have now pulled out of talks with foreign powers, in protest at the international community's inability to halt the bloodshed.